We like to say that using this cleaner is like having a spa day while you clean! It smells amazing! 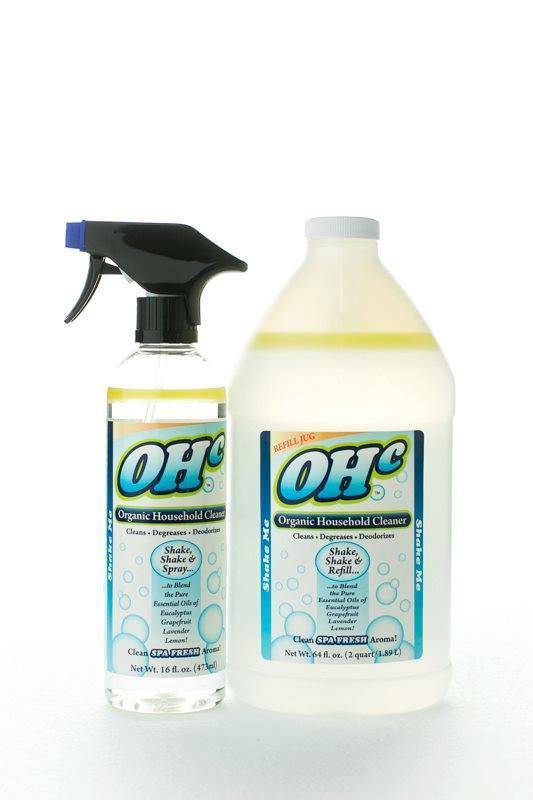 OHc, Organic Household Cleaner, is a patented plant-based all-purpose cleaner and degreaser formulated with a proprietary blend of pure, therapeutic grade, organic essential oils of eucalyptus, lavender, lemon and grapefruit. It contains no added alcohols or emulsifiers and provides soothing aromatherapy relief while cleaning. OHc is a healthy alternative to harsh chemical cleaners and contains no toxic chemicals, preservatives, dyes or surfactants. FDA approved testing shows it kills harmful bacteria, while its multipurpose cleaning action eliminates the need for other harsh cleaners. OHc is safe around children and pets and its healthy fragrance has the added benefit of providing relief from nasal congestion, allergy and cold symptoms. OHc works on all type of countertops such as marble, quartz and granite and restores the sheen by removing residue left behind by other products. OHc is an effective cleaner on all types of water-safe wood flooring, laminate, stone, linoleum, ceramic and porcelain tile—just shake, spray and mop. Use OHc to dissolve grease from stovetops and safely clean stainless steel on refrigerators, microwaves, and other appliances. Use OHc on mirrors, windows and glass for a squeaky clean surface. In bathrooms, showers and tubs or for tough jobs where an abrasive cleaner is required, just shake and spray the area with OHc then sprinkle baking soda on the surface and scrub away grime and soap scum. For extra tough jobs or for heavy build-up of grease and grime, mix OHc with baking soda to make a power-packed paste for a fresh and clean surface. Use OHc on children's toys and lunchboxes, clean auto interiors, vinyl, Bar-B-Que's, patio furniture, computer monitors and more. Shake vigorously before each use (product contains no added alcohol or emulsifiers and must be shaken before each use). Spray area to be cleaned with 3 to 5 sprays and wipe using a clean cloth. Always shake bottle after 3 to 5 sprays and repeat. When abrasive cleaning is required, spray OHc on area to be cleaned and then sprinkle a small amount of baking soda to enhance the cleaning power of OHc.